I tried to make a reservation at the Ridge Tahoe and the Lotus code came back as invalid. The best rate was then $104 per day plus tax. Can you check this out and let me know? It will be great to see you again Skip, I believe you will be the 6th Se7en to sign up. Go to the Hotel site (http://www.ridgetahoeresort.com/), select the dates and hit "Check Availability"
This will open a new page with the regular rates. In the top right of the page click the link to "Enter your access or promotional code"
You should get a message saying "Please note this change may result in changes to your prior selections.". Click confirm. It worked but this part wasn't there. In the top right of the page click the link to "Enter your access or promotional code"
There was a place for a code and I entered Lotus and it worked. The only surprise was that the $69 rate was only for weekdays, Saturday and Sunday cost $99 each. Is that correct or are we supposed to get the $69 rate for each day? The only surprise was that the $69 rate was only for weekdays, Saturday and Sunday cost $99 each. Is that correct or are we supposed to get the $69 rate for each day? It looks like it is only giving the rate for the duration of the event thurs-sun when we should get the group rate for 3 days on either side of the event. Thanks for pointing it out - I just emailed them and will let you know once it has been fixed. I got another confirmation email from Ridge Resorts with a different confirmation number and a daily rate of $89 which is the average of one day at $69 and two days at $99. Same charge as the first email. The two emails are different formats, the original one is far more detailed and the new one only shows the daily rate. The rates for the additional days have been fixed - waiting to hear back from them about your extra confirmation code. Regular registration ends on Monday. If you havent signed up yet head over to http://westcoastlotusmeet.com/2014/ and sign up today. I am happy to announce that we are having a new event on friday afternoon. 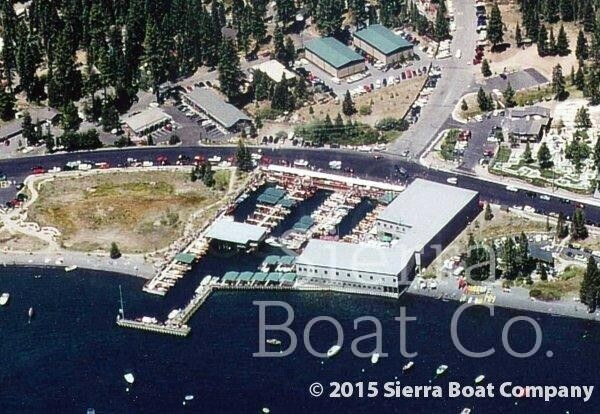 Those folks who wish to have a shorter drive than the High Sierra Tour can now opt to go for a shorter drive around the lake along with a stop at the 60,000 square foot facilities of Sierra Boat in Carnelian Bay. We are still finalizing the exact details about this event and will post the final details on the WCLM website in due course. Established in 1952, Sierra Boat is one of the oldest and largest antique and classic boat restorers in the country. The quality restoration of wooden boats includes the fine craftsmanship and finishes, but it is much more than that. In order to restore a boat properly; you must research the boat as to correctness of wood, finish, upholstery and mechanical details. With a process that has many similarities to car restoration, the hour long tour of their facilities will be a revelation to any fan of mechanical restoration. 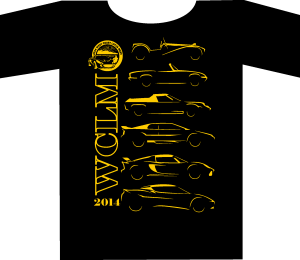 We have also been hard at work on the official T-shirt of the WCLM which will be given to all WCLM attendees. Kiyoshi has done an outstanding job on the graphic design and we can now give you a sneak peek at design. Done in a JPS-styled color scheme, the t-shirt shows correctly scaled silhouettes of important Lotus passenger cars starting from the Seven and continuing down to the Evora. We will have a limited number of extra t-shirts at the event for folks who would like to buy some extras for friends and family. I would like to welcome two new associate sponsors – Sports Car World and Sector 111. Both have a long history of supporting Lotus and we are delighted to have them on-board as sponsors of the 2014 West Coast Lotus Meet. The 2014 WCLM would not be possible without the generous support of all our sponsors and I’d like to personally thank them all for extending their support to the event. Those are all the WCLM updates we have for the moment. As more things happen we will continue to post them on the GGLC blog as well as on the WCLM Facebook page. If you have not registered for the 2014 WCLM yet, head over to http://westcoastlotusmeet.com/ and sign up today for the best Lotus event of the year. I look forward to meeting everyone in person on October 2nd.